Warm weather is my favorite weather to get dressed for. Why? Because you can be totally lazy and no one can really even tell. Grab a dress, throw on some shoes, don't forget your purse... you're good to go. As you may be able to tell from my recent pictures, I'm going through the laziest lazy phase where I just wear the same outfits over and over and over. 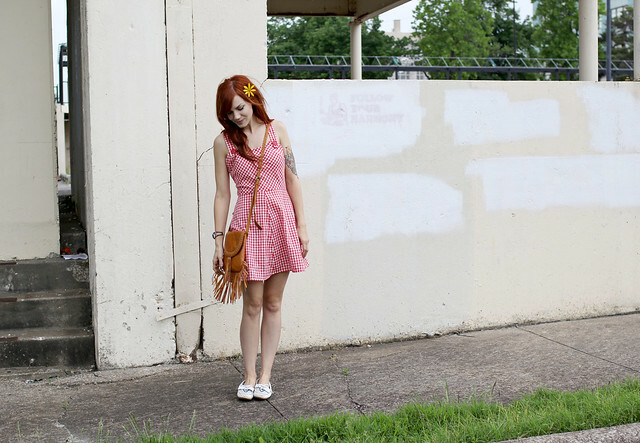 I was glad to get this dress from Exile Vintage to kind of bust me out of that rut this week. I probably need to get a few more exciting pieces to light a little fire under me. Otherwise, I may stay in the same t-shirt and cut offs for the rest of summer! ;) Who am I kidding? It will get way too hot for that! You can't beat a dress on the muggy days. **Exile is offering you guys 20% off with the code SKUNKBOY for the next week! Check it out-- they have SO MUCH good stuff! 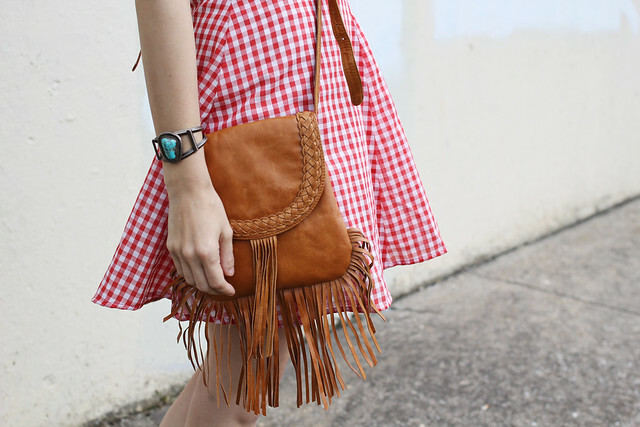 Love the red tablecloth pattern on the dress, really pretty! That dress is wonderful. I've been obsessed with gingham lately. Ya know, if by lately I mean forever. I totally get you, one dress can kinda life your whole spirits and sometimes even change the direction of your style a little! you look so cute! I love Exile :) Just used the coupon code for a little early birthday treat to myself haha, thank you! Such a cute dress! You look ready for a picnic in the park. I love love love that dress! SO cute. You look SO INSANELY LOVELY in this dress!!! Love the red and yellow color combo! So cute! 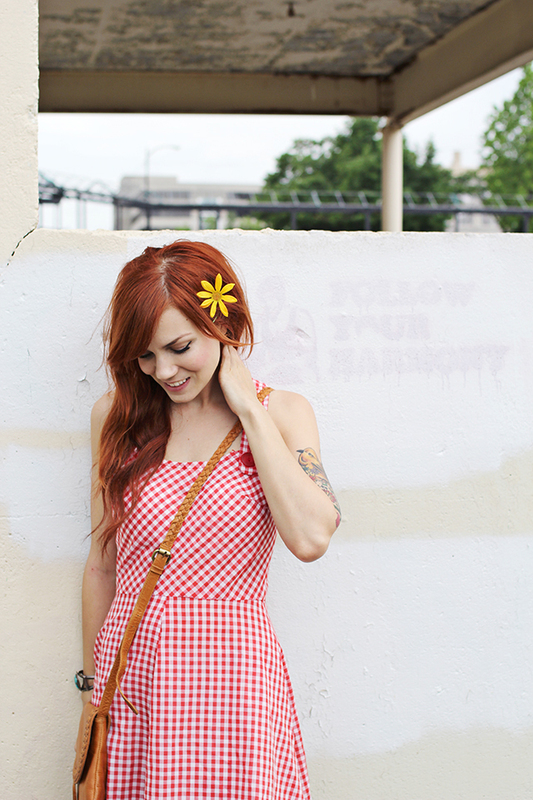 And I'm excited to bust out more summery dresses for these rising temps! Eep! So pretty! I love the button details on the back! Ha, preach it! If I'm not mistaken Missouri has pretty muggy weather just like Philadelphia so fashionable summers would be impossible without pretty dresses. You look like a doll in this one! Aaaaaah, that dress is to die for! !